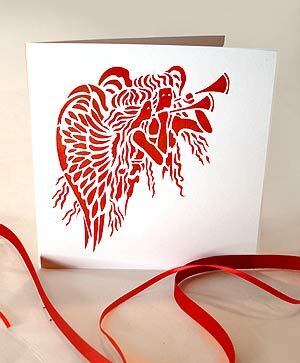 The Mini Angels Stencil is perfect for creating your own festive cards. 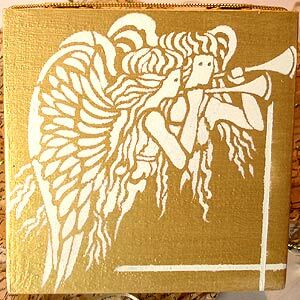 A small detailed stencil of two beautiful trumpet playing angels. 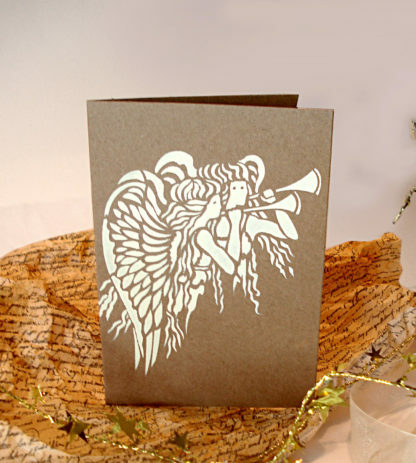 This Angel Stencil is small enough for small cards and still has lots of detail – beautiful angel design. Also perfect for small keep-sake boxes, picture frames and other small accessories. See size specifications below. 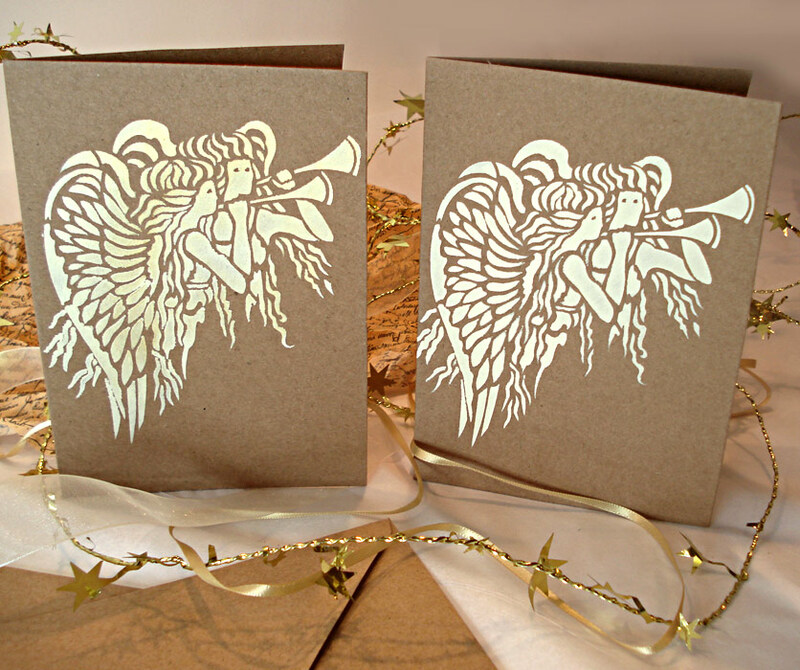 Above and top – the Mini Angels Stencil in Nougat Stencil Paint on our A6 Brown Craft Cards. 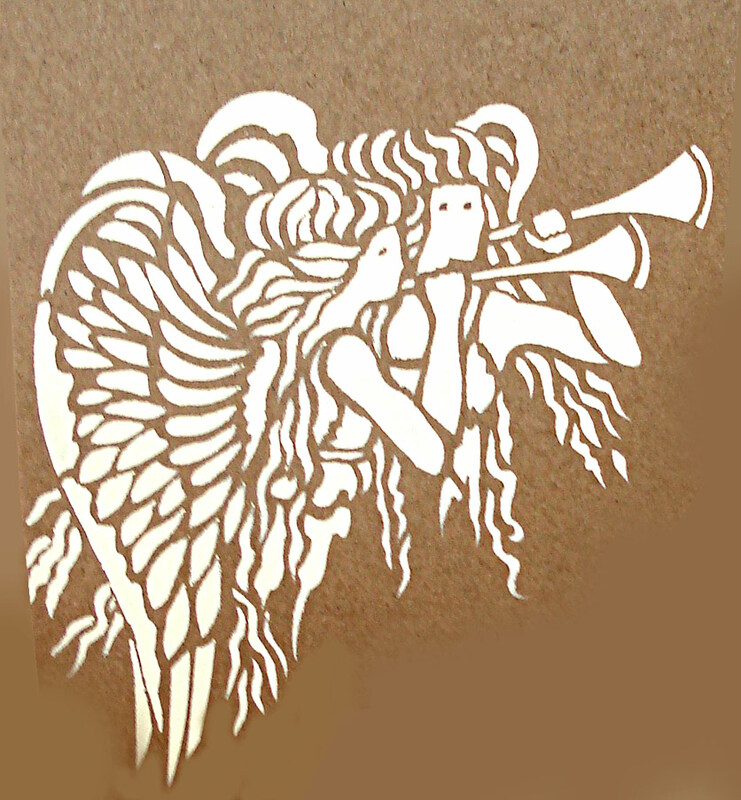 Above – the Mini Angels Stencil in festive Very Berry Stencil Paint on our Square White Cards. 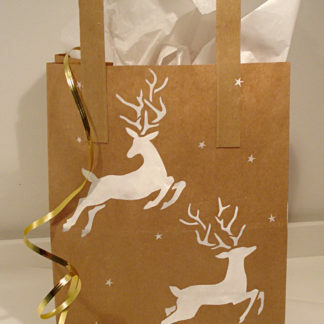 Use the Motif Metallic and Glitter Stencil Paints to add extra sparkle and lustre to your creations! 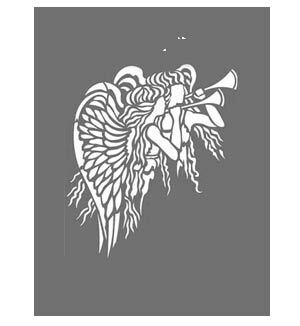 See also our Small Angels Stencil and Large Angels Stencil. Above – close up details of cards stencilled with the Mini Angels Stencil. Above – Mini Angels in Paradise Blue, Persian Blue Stencil Paints and Rainbow Glitter Paint highlights. 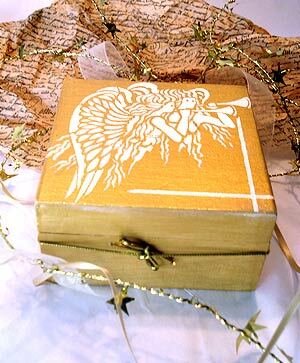 Above and below – the Mini Angels Stencil is perfect stencilled onto a pretty keep-sake box. Above, top and below – this pretty box is painted first with our Nougat Stencil Paint and two coats of Antique Gold Metallic Stencil Paint and then stencilled with Nougat Stencil Pant and with Mocha Stencil Paint for the eye details. 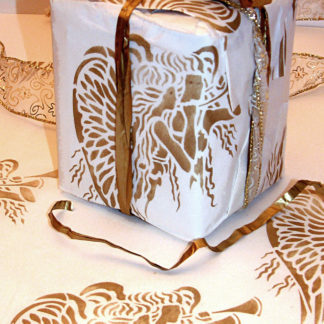 Above – additional lining details are created between two rows of masking tape, painted with Nougat Stencil Paint – a great finishing touch. 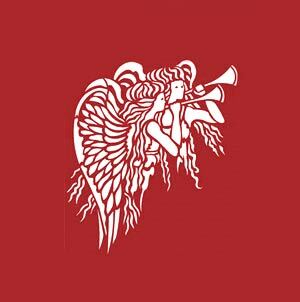 Above – the Mini Angels Stencil shown in simple Vanilla Stencil Paint on a festive red background. 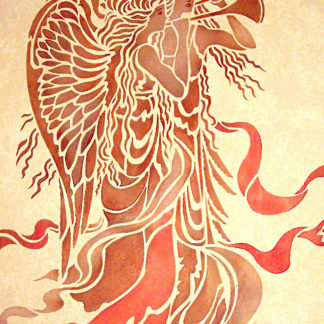 The Mini Angels Stencil is a one layer stencil with additional layer two eye details, on 125 micron Mylar. 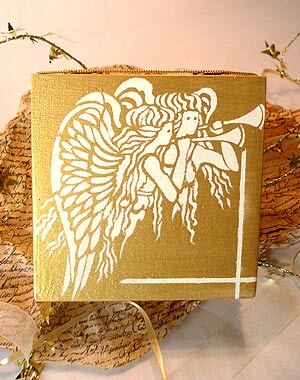 The angels motif measures approximately 11cm/4.25″ high by 10cm/4″ at its widest points. Sheet size 17cm/6.75″ x 20cm/8″. 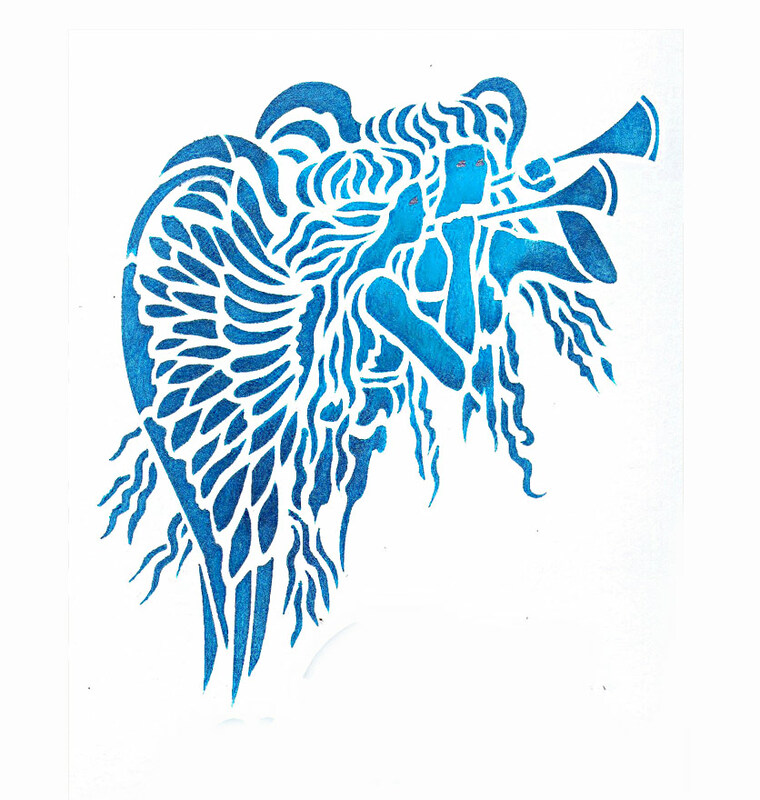 Left – the layout of the Mini Angels Stencil sheet, showing layer two eye details.